Throughout the James Bond series of films and novels, Q Branch has given Bond a wide variety of vehicles with which to battle his enemies. Among the most noteworthy gadgets, Bond has been equipped with various vehicles that have numerous modifications to include weapons systems, anti-pursuit systems, alternate transportation modes, and various other functions. Pierce Brosnan drove the convertible Beemer in The World Is Not Enough, but it was a BMW in name only. The Z8 was still a prototype when filming started, so the film featured a Cobra kit car wearing BMW skin. We’re still not sure where Q found room for the surface-to-air missiles, let alone the six cup holders, but now we know where they put the movie camera. The Z8’s inclusion in The World Is Not Enough was the culmination of a product pacement deal worked out with BMW that started with Goldeneye in 1995 (Z3) and continued with Tomorrow Never Dies in 1997 (750iL). The Z8 didn’t see much action in the movie, and met it’s demise at the blades of one of the King Buzzsaw Helicopers. The Z8 was introduced at MI6 headquarters, drove through the Azerbaijani oil fields, and saw combat action on the docks outside of Valentin’s caviar factory beside the Caspian Sea outside of Baku. 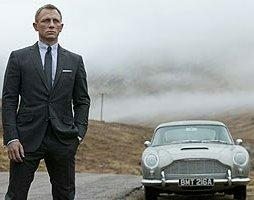 As the Z8 is being sawed in half, Bond remarks: “Q’s not going to like this!”. The Z8 was equipped with two retractable, side-mounted Surface-to-Air Missile Launchers hidden behind the forward side fender cooling vents, remote control capability, and, amazingly, “six beverage cup holders”. 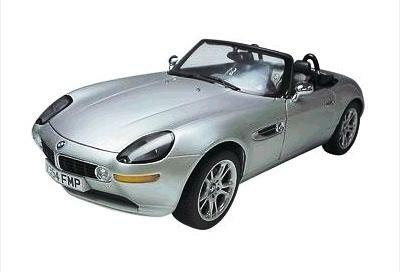 Brand new 1:12 scale diecast car model of BMW Z8 James Bond 007 From “World Is Not Enough” Movie die cast car by Kyosho. Dimensions approximately L-15, W-6, H-4.5 inches.